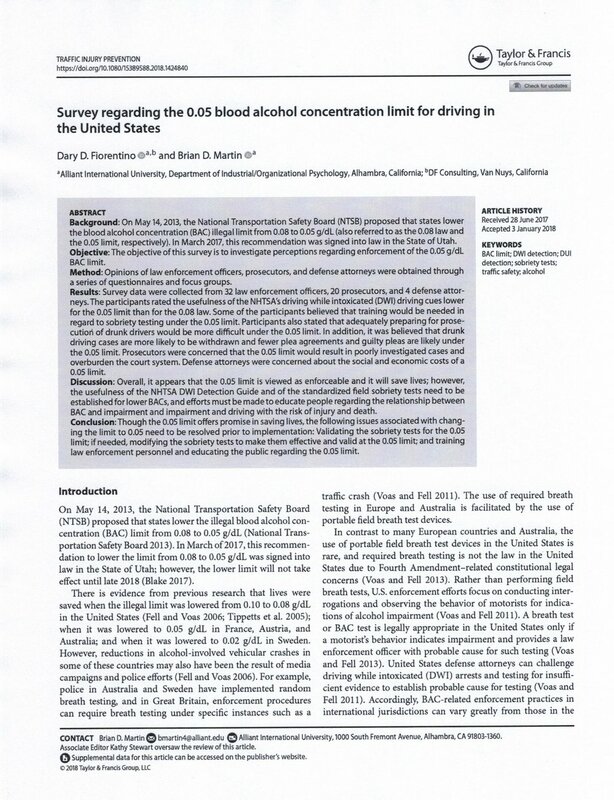 Background: On May 14, 2013, the National Transportation Safety Board (“NTSB”) proposed that states lower the blood alcohol concentration (“BAC”) illegal limit from .08 g/dL to .05 g/dL (also referred to as the “.08 law” and “the .05 limit,” respectively). In March of 2017, this recommendation was signed into law in the State of Utah. Objective: The objective of this survey is to investigate perceptions regarding enforcement of the .05 g/dL BAC limit. Method: Opinions of law enforcement officers, prosecutors, and defense attorneys were obtained through a series of questionnaires and focus groups. Results: Survey data were collected from 32 law enforcement officers, 20 prosecutors, and four defense attorneys. The participants rated the usefulness of the NHTSA’s DWI driving cues lower for the .05 limit than for the .08 law. Some of the participants believed that training would be needed in regard to sobriety testing under the .05 limit. Participants also stated that adequately preparing for prosecution of drunk drivers would be more difficult under the .05 limit. Also, it was believed that drunk driving cases are more likely to be withdrawn, and fewer plea agreements and guilty pleas are likely under the .05 limit. Prosecutors were concerned that the .05 limit would result in poorly investigated cases and overburden the court system. Defense attorneys were concerned about the social and economic costs of a .05 limit. Discussion: Overall, it appears that the .05 limit is viewed as enforceable and it will save lives, however, the usefulness of the National Highway Traffic Safety Administration (“NHTSA”) DWI Detection Guide and of the standardized field sobriety tests need to be established for lower BACs, and efforts must be made to educate people regarding the relationship between BAC and impairment, and impairment and driving with the risk of injury and death. Conclusion: While the .05 limit offers promise in saving lives, the following issues associated with changing the limit to .05 need to be resolved prior to implementation: validating the sobriety tests for the .05 limit; if needed, modifying the sobriety tests to make them effective and valid at the .05 limit; and training law enforcement personnel and educating the public regarding the .05 limit.